At a gas stop at a Chevron in Lakehead, California, I stop in the middle of the candy aisle to read email. “Hey! Why does your license plate say DIE?” The voice from the front of the store asks. He says it again, then again, before I realize he’s talking to me. I burrow back into email next to the Snickers. He calls out again, and this time he wants to know what’s really going on with the blood-red Mustang parked outside. The cashier’s name is Mike Spencer, and he’s a car guy. A car guy, not normally a Ford guy. His brother has a Dodge Challenger Hellcat, his dad has a 1966 Chevrolet Chevelle with a 396 small-block V-8, and he has a 1979 Chevrolet Camaro Berlinetta with a 350 small-block. The 2018 Ford Mustang GT I parked in front of his gas station has earned his attention. In the more than 50 years since the Ford Mustang was born, it’s become more than just a muscle car. It’s become an icon. The Mustang still draws the envious glances of other drivers, even after more than five decades. 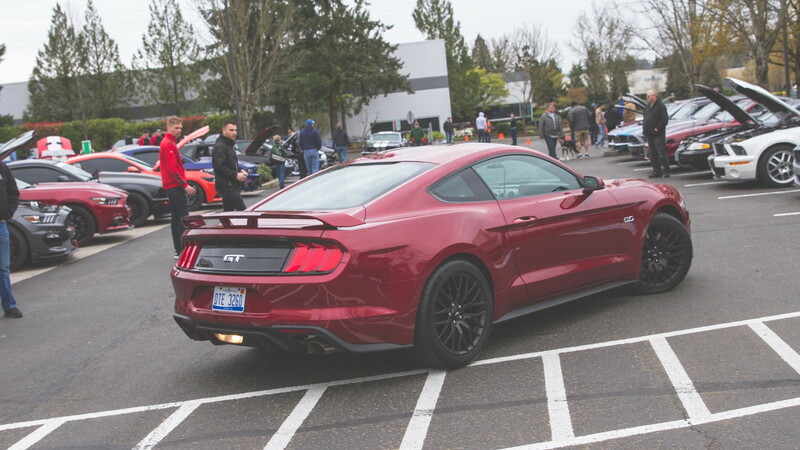 Within minutes of pointing Motor Authority’s Mustang GT north from San Francisco, headed toward Portland Cars & Coffee’s Mustang Day in Portland, Oregon, our Mustang GT made itself known. Other drivers made it clear: When you drive a Mustang, you’re part of a uniquely American institution. It’s not an exclusive club by any means. The only requirement for acceptance into this club is a pony on the grille. I blasted up Interstate 5, and random Mustang drivers would honk and flash their lights. I downshifted into second from fourth on exit ramps, floored it out of parking lots, and rang the 5.0-liter V-8 all the way to its 7,400-rpm redline on nearly every single on-ramp with the exhaust in borderline obnoxious Track Mode. Almost all of them a thumbs-up with a huge smile. Sometimes the thumbs up would come from non-Ford owners, and that’s when it hit me: The Mustang isn’t just a seat in the grandstands, it’s a perennial spot in the automotive enthusiast parade. Between cashiering and directing spandex-clad bicyclists to the restrooms, Mike goes on about the Mustang. As I leave, he braces himself to inform a customer that their U-Haul moving van might be too tall to clear the station’s overhang. Ford’s muscle car is a connector of people. At that stop, a gearhead who owns other American muscle cars struck up a random conversation with someone, just because of the Mustang. That happened, time, and time, and time again. 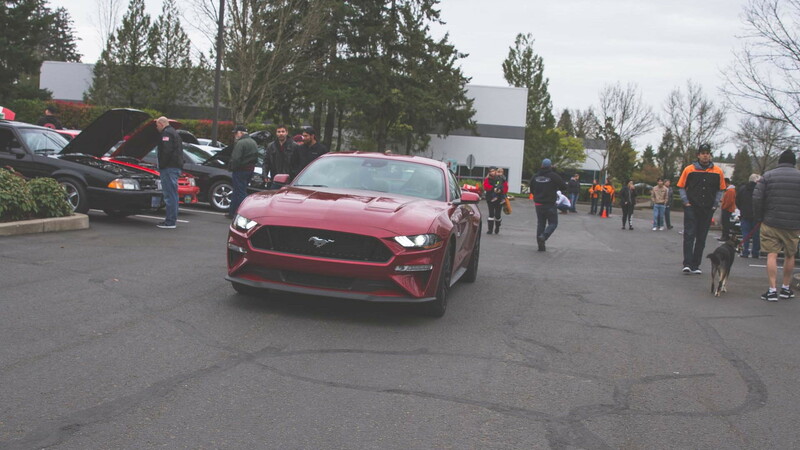 By the time the Mustang GT pulled into Portland Cars & Coffee for Mustang Day, the chorus of family grew into a full-fledged reunion. Fellow Mustang drivers walk over instantly to start checking out the refreshed 2018 Mustang. Portland Cars & Coffee Ground Control volunteer Jim, a fit military veteran, barely let me out of the car before he asked how it rode. Zhenya, a teenage event volunteer, asked if he could sit in it and play with the controls. 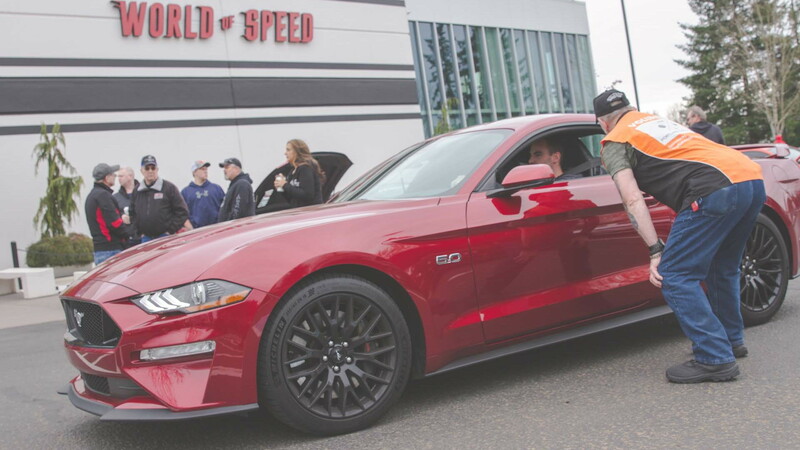 Shelby GT500 owner Derek Vlcko in his Mustang jacket wanted to know what options the car had, pricing, power output, and what’s different from the 2017 model. I wandered the event and mingled with my impromptu Mustang family, and asked people why the Mustang’s still so important to America and car culture. Here’s what I heard. Dan Jones will tell you he became an aircraft mechanic because the automotive class was full. While his day job for 37 years was working on United Airlines planes, his passion and hobby always has been cars. He’s owned Fords most of his life except for one 1955 Chevy sedan, which turned out to be a lemon. Despite not proclaiming to be a Ford family, all three of his kids have owned Mustangs. Eventually he got a Mustang, a 1965 coupe he bought in the early ‘70s. In 1980, he bought a second ‘65 coupe and drove it to work, then sold it to his son, who drove it another nine years before he parked it at Dan’s house. There the Mustang sat—for 18 years—until his son told him to do whatever he wanted with it. Dan remembered a black and gold GT350-H sitting in the Hertz parking lot at work. He embarked on a restoration, turning his coupe into a Hertz tribute. After 20 years, he finished his 1966 Hertz GT350 Shelby tribute car. Everyone should own a Mustang, Dan says, “because the Mustang is a car all its own.” And he doesn’t worry that one day the car will go away, even if the rest of the car world goes electric. “It’ll always be there,” he said. Trevor Simons can’t even remember how he became an automotive enthusiast. He’ll tell you he can remember when his dad had a 1970 Plymouth Barracuda with a 340 cubic-inch V-8 and 4-speed transmission. After school Trevor would head to the garage to learn as he worked beside his dad, turning wrenches on restoration projects. He’s not a Ford guy per se, he’s a car guy. Financial troubles drove Trevor to part with a 1977 Datsun 280Z turbo build. After he was back on his feet, he bought a 1986 Honda Rebel 450. While wrenching on the bike Trevor discovered it was actually bike No. 71 of a two-year run. An inoperable 1966 Mustang crossed his path on Craigslist, and after a game of let’s-make-a-deal, Trevor ended up with a blue horse that needed some attention. “Over time I’ve been turning the car into a monster turbo build,” he says. It’s evident by the twin 57 snails mounted off the engine huffing 12 psi. The CX Racing intercooler does little to hide the horse’s newly modified heart. Despite galloping the earth for 52 years, Trevor is quick to point out “the car’s still all factory steel, and it has the original factory trunk tag on it.” The tag is a faded, crumpled reminder of the car's heritage and the color it originally had leaving the assembly line. "The factory silver on it, it just means something," he says. Trevor says everyone should own a Mustang someday “because they are fun.” He doesn’t think the Mustang will ever go away. John Portello can still smell the oil-soaked dirt from the small gas station and garage down the street from where he grew up. He built model cars before grafting together a homemade go-kart at the age of 12. He joined the military after high school, and it was in Germany where he saw his first 1964 1/2 Mustang. He’s owned everything from Oldsmobiles and Dodges to Subarus and a few Jeeps, but he always seems to gravitate toward Fords because of their racing results and friends with common interests. In January 1994, John’s friend bought a 1993 Ford Mustang Cobra—the last year of the Fox body and the first for the SVT Cobra. Fast forward to 1995 and John put his first Mustang in his stable, the red Cobra from his friend with a mere 1,200 miles on it because he liked the body style. Over the last 23 years John’s upgraded it with Baer brakes—it was the first car to get one of that company’s four-lug big brake kit—a full interior roll cage, five-point harnesses, and a cam. But it’s the bright-red color, one of only 414 red-on-gray 1993 Mustang Cobras, that matters to John. Everyone needs to own a Mustang as ownership gets you into a close-knit group that is “like family,” John says. Victor Weitzel’s automotive passion came from his dad, a classic hot rodder from the ‘50s who used to race stock cars at the old Portland Speedway. He and his brother Jim would help with the race cars from the time they learned what a 9/16 wrench was. Pontiacs were his first love in the muscle-car scene, his appreciation for Fords and the Mustang came later. Since 18 years old, he’s always owned some form of a Pontiac A-body and today he still has a 1967 GTO along with a 1969 restomod Firebird convertible. His first blush with a Mustang started when his father rented a 1969 model for a trip to the Oregon coast. He remembers sitting in the back seat and looking out the quarter window. “This is so cool!” he thought. In 2001, Victor read the Fresno Bee on a Sunday morning when he came upon a classified ad for a 1970 Ford Mustang Mach 1. He called the number in the ad and the woman on the other end of the line said the car was a graduation gift from her father. When he got to see it in person, he realized it was factory, down to the hubcaps. The Mustang bug bit—it bit hard—despite an hourlong interrogation by the owner regarding his intentions. It was his. In 2008 Victor went searching for something more modern to drive daily. Something with some creature comforts and better reliability. “I figured it would end up being a 6-cylinder coupe given the budget,” he said, but he found a 1999 Cobra on eBay in September 2008. Listed for $13,500 with only 58,000 miles on it, he wasn’t sure if it was real. After the auction ended and the car failed to sell he contacted the seller, struck a deal, and picked it up. The shaker hood, which wasn’t an option for this particular car, came off a 2003-2004 Mach 1. The previous owner put it on, and for Victor, it set the car apart. Owning a Mustang is “about as much fun as you can have while having your clothes on,” he says. Derek Vlcko grew up in a Ford family. His mother’s first car was a 6-cylinder 1964 1/2 Mustang notchback. His grandfather worked at Ford for more than 40 years. Derek and his father went to the Detroit auto show every year together. “Speed was pretty much tattooed in my brain,” he said. He remembered blasting down the freeway to a Tigers game in his dad’s 1989 Porsche 911 Targa. While his dad had a long run of Porsches, it’s always been the rumble of American muscle that’s drawn Vlcko. A week after the 2011 Mustang GT was announced, Vlcko put his modified stage-2 Subaru WRX up for sale. It sold before he even placed his order in for the 2011 Mustang GT. But it wasn’t the Mustang GT he wanted, it was the then-new 2011 Shelby GT500. He couldn’t stop looking at it, at least until he saw the window sticker and its markup. After a few years with the Mustang GT he finally traded into a used 2011 Shelby GT500. The Shelby’s hand-built engine appealed to Vlcko, that and the Tremec transmission. Mustangs are as much a part of American culture as Levis and Coca-Cola, he thinks. It’s about being an American. Danielle Thatcher and her husband Aaron learned their Mustang lessons from their parents. Danielle’s family built and raced cars down the drag strip while Aaron’s father had a passion for muscle cars. Both grew up with Fords. Danielle bought Aaron their current 2016 Mustang GT, and it’s now his daily driver. 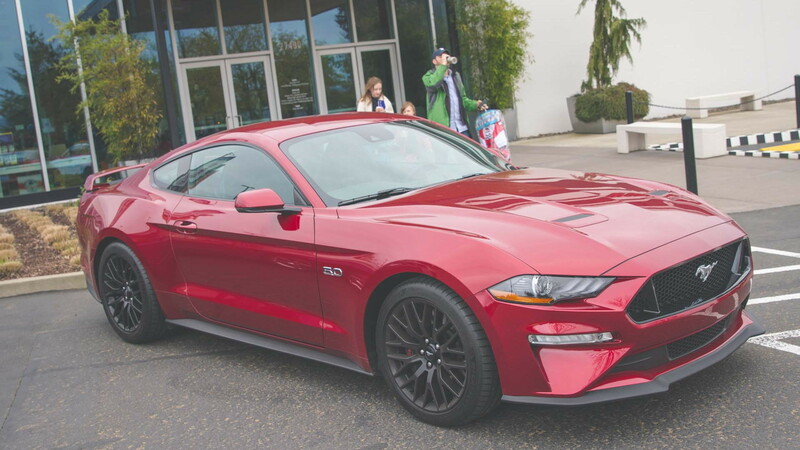 Their Mustang story started with a 2012 GT Premium, which was traded for a 2016 GT Premium for its independent rear suspension that replaced the solid rear axle in the current Mustang generation. To Danielle, the 2016 just looks better than their 2012 Mustang. The toggle switches inside the 2016 model are cool and functional as they change vehicle dynamics that range from steering weight to traction control limits. Mustang ownership is a must for everyone because they are fun, Danielle says. She doubts the Mustang ever will go away. “It’ll keep going just like it has,” she says.